"You're going to knock over a bank with a magic marker? What are you going to do? Write on them?" On the surface, Barry Levinson's Bandits might seem like a friendlier, funnier version of Natural Born Killers. It is true that both center around a pair of criminals whose fame stands to eclipse their very existence, but Levinson's film is less about cartoon violence and more about human relationships. The crime spree of Bandits' Joe Blake (Bruce Willis) and Terry Collins (Billy Bob Thornton) make them media celebrities, but it is that old adage of the love triangle that threatens to destroy them, and to serve as the core of this smartly written comedy.Levinson structures the film in flashbacks, and opens with a botched bank heist that leaves Blake and Collins surrounded by an army of Los Angeles police, ala the conclusion of Butch Cassidy And The Sundance Kid. The story then bounces back to their escape from the Oregon State Prison, and traces how they became the infamous "Sleepover Bandits," who perform their heists by spending the night before at the home of a local bank manager, and then accompanying him to the bank to rob it. The criminal partnership between Blake and Collins is threatened by Kate (Cate Blanchett), an unhappy but very lively housewife who accidently becomes part of the robbery team and becomes a romantic spike between the two.Blake's dopey cousin Harvey (Troy Garity), who longs to be a stuntman, serves as the lookout during the robberies, and is reminiscent of Michael J. Pollard's character from Bonnie And Clyde. His presence is only necessary for his involvement in a third act sequence, and his character noticeably lacks the depth of the three leads. A three-sided romantic comedy requires three strong leads, and Levinson gets that from his cast. The chemistry between Willis and Thornton is the driving force here, and they both have a nice screen presence together. Willis does his typical smirk routine throughout, but is further burdened by an annoyingly bad hairpiece for some unknown reason. Thornton, on the other hand, steals the film and gives a terrific comedic performance as the hypochondriac Collins. His low-key delivery borders on being flawless, and proves himself to be a wonderful comic actor. Who knew? A good chunk of Bandits concerns the slowly disintegrating relationship between Blake and Collins, all fueled by the electric presence of Kate. Blanchett has a good time with her role, and I enjoyed the seemingly easy way she exudes a natural appeal.Screenwriter Harley Peyton's script explores the relationship between Blake, Collins and Kate with plenty of humor, much of it subtle, and it is the small dialogue exchanges that sparkle and make Bandits one of those films that I really hated to see end. Realism issues aside, this is an entertaining ride. Image Transfer Review: MGM has released Bandits in 2.35:1 anamorphic widescreen, with a 1.33:1 pan & scan version on the flipside. What is most impressive about this disc is the stunning transfer, which is full of brilliant, natural colors that reveal a generous level of detail. Black levels and shadow depth are rock solid, too. There are literally no source print or compression flaws to be found on Bandits, though some extremely minor edge enhancement is barely a concern here.Excellent. Audio Transfer Review: The primary audio track here is a 5.1 Dolby Digital mix that doesn't get too flashy, but for a film like Bandits, which is largely dialogue-driven, that is not too important. The entire soundtrack is mixed very well, and dialogue always comes across clear and intelligible. Minimal rear channel effects are limited to the occasional helicopter or car, and don't offer much in the way of creating a full surround experience, not that it's necessarily needed for a film like this.Dolby 2.0 Surround tracks in French, Spanish, and Portuguese are also included.Nice. Extras Review: A nice set of extras from MGM on this special edition, although I really would have liked a Levinson commentary.Inside Bandits (20m:36s)While this disc sadly lacks a Levinson commentary, this short features interviews with the director, as well as cast and production principals. The origins of the story, which are based on a pair of real-life criminals are discussed, and how the story was turned into a screenplay. A few tidbits of trivia, like the fact that Val Kilmer was originally cast in the Bruce Willis role, pop up here and there, but for the most part this is a typical making-of piece. It concludes with Willis and Thornton setting up for their fall through a plate glass window, only to be replaced by their stunt doubles. Deleted ScenesThere are four deleted scenes, presented in an unfinished format. The first two are centered around the first bank manager robbed by the "Sleepover Bandits," and his extra-marital affair. These two scenes add a little depth to that character, and offer a nice exchange between Willis and the jilted girlfriend of the bank manager. The last two scenes run under a minute, and don't offer much in the way of substance. The scenes are:The Miller's Other Problem (7m:15s)We're Gonna Need Your Vault Keys (1m:32s)Maybe It's Time To Quit (:51s)A Walk Around The World (:50s)Alternate Ending (1m:01s)This is a brief variation on the ending shown over the film's credit sequence, and is essentially the same except for one visual gag. This scene is also available with a completely unnecessary commentary from Cate Blanchett.Creating Scene 71 (5m:58s)I liked this segment, which explains how a single scene develops from page to screen. In this case, it's the sexual chemistry that builds during a scene between Willis and Blanchett sharing a bed, and Levinson discusses the development of the final scene. At the conclusion of this piece, there is the option to jump directly to the actual scene in the film.Trailers (Bandits, Windtalkers, Hart's War, Rocky:SE), 32 chapters and subtitles (English,French, Spanish, Portuguese) complete this special edition. With a trio of likeable leads, and a healthy mix of humor, there is not much to dislike about this film. 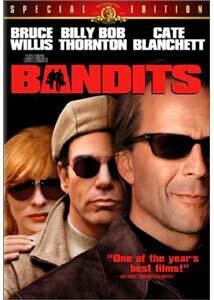 An accomplished director like Barry Levinson knows how to tell a story, and Bandits is an extremely enjoyable film from start to finish. It may not be believable or realistic in any way, but it is one of those experiences that is just simply fun to watch.Highly recommended.